I absolutely love the flavor of orange. It probably all started with Creamsicles as a kid, that incredible treat of creamy vanilla ice cream surrounded by orange popsicle. Those were the dreamiest. Or those little tiny cups of vanilla ice cream swirled with orange sorbet that we ate with a little flat wooden spoon. The best! As I think about those delicious treats, I’ve been wanting to pair orange granite with a simple vanilla panna cotta. 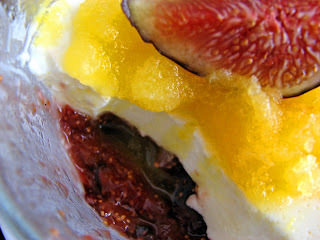 And since I had some fresh figs on hand, I thought it would be fun to incorporate a fresh fig compote to the mix. 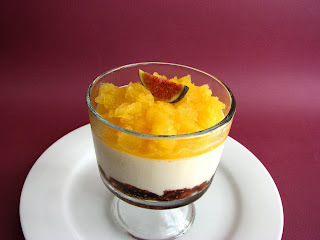 I like the idea of different textures and flavors layered upon one another and this one has several great sensations, from tart to slightly sweet and creamy to slushy iciness. The orange flavor complements the figs perfectly. - Fleming flavors her panna cotta with 1 T Framboise. I substituted 1 t vanilla to simplify the flavor profile. - I might be tempted to add Rosemary Syrup to my Fig Compote another time. Chop the figs and place in a saucepan with the water. Cook on low heat until the figs are soft and juicy, stirring to prevent scorching. Pull off the heat and adjust sweetness. Cool completely. Spoon fig compote into serving glasses or dishes and set aside. Place 1 1/2 tablespoons of water in a small bowl. Sprinkle the gelatin over the water and let stand a five minutes to bloom. Warm the cream with the sugar until it dissolves. Remove from heat. Liquify the gelatin over a bain marie and add to the cream, whisking to combine thoroughly. Add in the crème fraiche and whisk until smooth. Stir in the vanilla. Pour into tall glasses or parfait glasses, cover with plastic and refrigerate. Chill until firm, about 3 hours. Combine water and sugar and bring to a boil to dissolve. Cool. Combine with juice and pour into a shallow tray or pan. Place in freezer and let set for about an hour until it begins to firm up. Take a fork and slush it up every half hour or so until it is set. Once the panna cotta has firmed up, top with Orange Granite. Serve immediately. 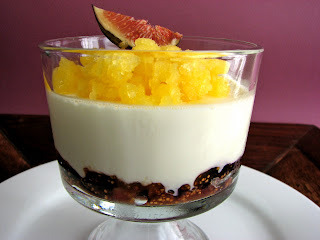 fig compote... check, panna cotta... check, citrus... check... all great elements for a perfect verrine! I love panna cotta, and I like the addition of creme fraiche. Sounds wonderful and the photos are beautiful. I need some of that right this moment! wow. Oh yum. I could do with a glass of that right now. This recipe is nearly seven years old, so I feel a little silly for asking. But you've put the figs into one serving dish, and the pannacotta into another. Will the pannacotta set if you pour it warm over the figs, or do you need to cool and set it first and then assemble everything at the end? Hi, Jim. Thanks for your good question. 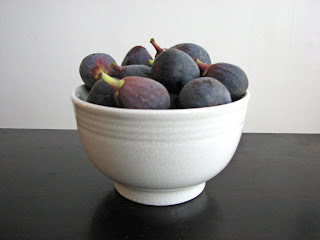 Make the fig compote and let it cool, then spoon it into the serving dishes. Then make the panna cotta and pour over the figs. The mixture isn't all that warm since you're adding creme fraiche to it. Once the panna cotta is set up, garnish the tops with the orange granite and serve immediately.